Know that sharp ache you get after an intense workout that is usually in your neck, shoulders, or upper back? 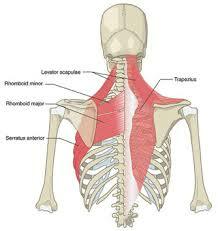 It can be difficult just to move your shoulders without feeling pain, let alone continue with your workout. Even worse, this pain can linger on for weeks, or even months. If you are active, or lift weights consistently and feel a constant stinging pain in your muscle, the culprit may be muscle knots. A common problem for active people, muscle knots—technically called Myofascial Trigger Points, or MTPS—feel like a small knot to your fingertips. These knots can range from the size of a pinhead in smaller muscles to the size of your thumb in larger muscles. Muscle knots can cause pain in two ways: (1) latent trigger points, which are knots that only hurt when you put pressure on them, and (2) active trigger points, which are knots that actively refer pain along your neural pathways, causing it in non-localized areas. Trigger points in a constant state of contraction have excess metabolic waste and oxygen use because blood flow to this area stops—this sends pain signals to the brain. Because your brain wants to stop the pain, it commands the muscle to rest, which leads to under-usage of the muscle. This is what makes the muscle shorten and tighten up. If you are developing muscle knots frequently from lifting weights in your shoulders, neck, or upper, or middle back, the likely cause is a postural issue. For example, if you have rounded shoulders from sitting in a office, your back muscles are already overstretched because your shoulders are rounded forwards. When you complete some pull-ups, or rows, your muscle will be stretched even further when lowering the weight, then will forcibly contract when lifting the weight. This over-stretching combined with intense contractions can overstimulate your muscles causing those nasty muscle knots to form.